My seventh-grade science teacher repeated two facts so often that they are still crystal clear in my memory. The first was the definition of osmosis: “the passing of a substance from a lesser concentration to a greater concentration through a semi-permeable membrane.” The other was this: dented canned food can poison you with botulism, the deadliest toxin on the planet. Why these two facts seemed among the most important things to teach 12-year-olds in the 1990s is not exactly clear, but it stands to reason that at least the latter fact came from inherited wisdom. This middle-aged teacher in Arkansas had likely heard about botulism in canned food from his own mother and grandmother, seizing upon it as this singularly cool fact, relevant in the kitchen and in the science classroom. The terror of the botulism bacteria and the chaos it could wreak belied the boring, innocuous image of the tin can. By the time I was sitting at that molded plastic school desk, it was hard for Americans to imagine anything less scary than canned food. In a nation of Lunchables and DunkAroos, we believed in the power and safety of the food industry, of which canned food was a part. But I later became a student of history and, by a funny turn of events, began to study the history of canned food. I learned of a time when cans were novel and unfamiliar, and when they inspired distaste, fear, and panic. These experiences still shape America, and how it eats, today. 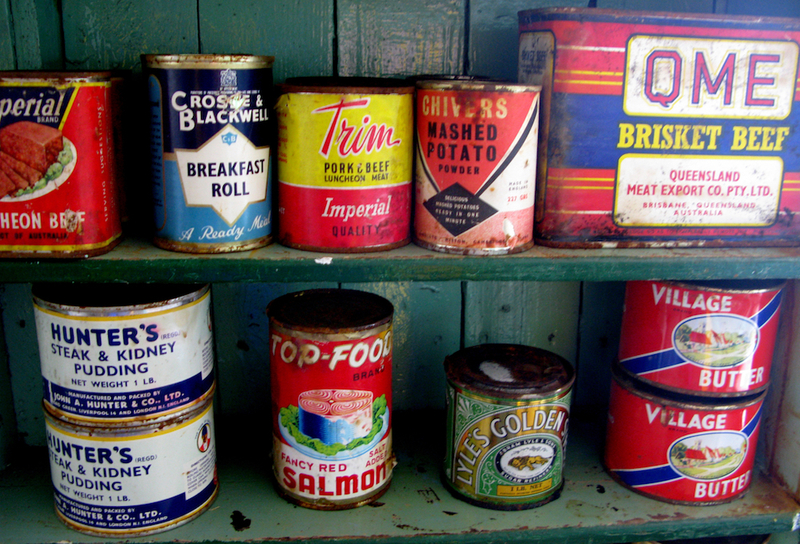 Canned food got its start in the opening years of the 19th century in France and moved to America by 1825, but only began to enter average American homes in the years after the Civil War. The war exposed millions of soldiers to canned food, and they brought the taste home with them. But the new industry also struggled to convince American consumers to consider its products viable and trustworthy. There were many reasons why early consumers weren’t all that interested in trying these new offerings. For one, the long hours that cans of food were boiled left the contents mushy, with an unattractive texture and taste. But even before tasting the food, many Americans were skeptical. To people accustomed to seeing and touching and smelling the foods they were about to eat, these hard-sided, opaque metal objects did not seem like food. The new method of industrial production and new way of eating felt foreign to American consumers, who had grown up eating food that was more local, more perishable, and easier to fit into existing categories. As the United States entered an era of industrialization and urbanization, the unfamiliar can embodied this time of rapid change. In the half-century after the war, innovations followed as the canning men—and they were mostly all men—built their business from the ground up, hoping to overcome consumer resistance. The canners perfected machinery to build the cans and process the fruits and vegetables; they organized professional trade groups; they worked with agricultural scientists to breed crops better fit for the can; and they invited government regulation as they helped craft pure food laws. In solving the problem of botulism, an industry threatened with destruction instead came back with a set of practices that not only revolutionized canned food, but the entire relationship between science, government, and the food industry in America today. The National Canners Association and California Canners League sprang into action, recognizing the particular vulnerability of this moment. These botulism deaths—widely publicized in mainstream media outlets—threatened to undermine the still-shaky foundation of the canned food business, fueling consumers’ deepest fears about these processed foods. The canners worked on two fronts. Even as they sought to displace responsibility and downplay media coverage of the deaths, they launched an expensive research and inspection campaign that would lay the groundwork for the American food safety system. In early December 1919, the canning and olive industries came together to fund a Botulism Commission of scientific experts tasked with producing specific strategies for safely processing olives to prevent such a crisis from happening again. After much negotiation, the Botulism Commission’s findings led to strict regulations for the processing of olives—240 degrees Fahrenheit for at least 40 minutes—and a statewide inspection service, funded by the industries, but overseen by the impartial California State Board of Health. By 1925, many of these standardized practices had expanded to other food products, covering sardines, tuna, and all vegetable products except tomatoes. In the process, three distinct groups—scientists, canners, and government officials—established a set of relationships. As they got to know each other and worked through their competing commitments and quirks, they built the network that would underpin the nation’s food system. Because the canning industry had taken a lead role in this network, many critical consumers were mollified, leading to acceptance of canned food, and later processed food, in the decades to come. This small story of a food scare and an emerging industry’s embrace of food safety regulation encapsulates the larger story of American commerce in the 20th century. In solving the problem of botulism, an industry threatened with destruction instead came back with a set of practices that not only revolutionized canned food, but the entire relationship between science, government, and the food industry in America today. In this early phase, the canners were as much a player in policing themselves as were external regulators. By the time I heard that questionable information about botulism from my science teacher in the 1990s, I was part of a food system awash in processed foods. By then, dented cans—or any cans—were very unlikely to harbor botulism bacteria, which had been largely brought under control by those new processing methods and regulations. This paved the way for our contemporary American food culture, in which we eat and unthinkingly trust processed food. Yes, the country still experiences occasional and ongoing food safety outbreaks. But rarely are these from canned food, which—along with the vast array of food products that line our lunchboxes and grocery store shelves—has escaped the reputation that first inspired my teacher’s inherited wisdom generations ago. Of course, the definition of osmosis is still pretty much the same. Anna Zeide is a historian and Assistant Professor of Professional Practice at Oklahoma State University. She is the author of Canned: The Rise and Fall of Consumer Confidence in the American Food Industry.